When I last wrote in this book little Mabel was but three months old, & now more than a year has passed away, &, no longer a baby, Mabel runs about & calls "papa" or "mama", & begins in her childish way to understand some of the wonders & delights of the w her little world—Every day has made her dearer to us, & she seems to us the most delightful child that was ever given to a happy father & mother. Whilst I write, my little Mabel sits beside me, scribbling on white paper to her heart's content, every now & then making a violent rush at my book, with a sly twinkle in her merry eyes. She grows daily dearer to us . . .
Our dear child is two years & three months old, & a bright intelligent happy child she is. She is a most sweet companion, understanding so well what we say, & talking away easily herself. She is the delight of her parents' hearts, who think (as other parents do of their children) that there never was such a sweet, loving, & intelligent child. She is certainly brimming over with affection, & I need not say it is amply returned. Mabel takes great delight in her baby sister, & assumes all the duties of a little Patroness. 1868-01-21 . . . she is a most useful little maiden, & a real help to her mother, besides filling the home with sunshine. When I kissed my little Mabel tonight after saying to her her evening hymn, she began to talk to me about the picture over the chimneypiece (a photograph of Holman Hunt's Light of the World)—She always calls it "that kind gentleman Jesus Christ", but her little mind is sorely puzzled to know how Jesus Christ can be the same as God & Our Father, & Our Lord—To explain to her very simply that which can neither be explained nor understood, I said "But May dear don't we sometimes call you May, & sometimes Mabel, & your name is Mabel Watson, & sometimes even Papa calls you Mab"? "Ah yes, she said, & Ma, once when I was coming home with Aunt Hope, & it was getting so dark, Aunt Hope said 'It is getting so dark, I can hardly see you my little Poppets'" "Yes my darling" I answered, & the trusting little heart was satisfied, kissed me over & over again, & quietly, happily went to sleep. 1868-07-07 "May has not been quite well" . . .
May is as sweet & lovely as ever, as we think, & is really growing a most useful little maiden. I could not have had a more efficient, let alone a sweeter helper, the day I was packing up my things to go away. 1869-11-30 "She is indeed a willing child, always ready to help, & quick, so quick to sympathize in sorrow or in joy." Mabel, my eldest born, is my dear little companion & helper, an active willing child, sweet-tempered, loving & good. How much we both enjoy her short morning lessons! She can now read with east the Sequel to the "Step by Step" & enjoys it thoroughly, & she write many a little letter without assistance except as to the spelling. She is not really pretty I believe, but to me she is such a bonny child, her fair hair & complexion, honest blue eyes & loving looks are far better than mere beauty of feature. On dear Mabel's birthday, the 23rd of May, we had a large children's party—& a more successful one could not have been. We all entered into it heart & soul—R. & Dr Merz put up two pretty balloons, wh were much applauded, & we had games of "blackthorn" "puss in the ring &c &c & all thoroughly enjoyed. We dispensed tea & cakes on the grass—a meal which was done full justice to. Never can I forget the merry little faces & voices of that day. 1870-07-27 At her aunt Nellie Watson's wedding "Our dear little Mabel was one of the bridesmaids, & we should like to have seen her, although her vanity was quite sufficiently aroused by the remarks of others." Our dear little Mabel is now taught by Miss Herbert, with the Jullions & Pattinsons—She enjoys her lessons extremely & the companionship I think does her good. Miss Herbert says she never knew any one so quick in music, & in other things too her progress is very satisfactory. 1872-05-14 "May is much occupied with her school & schoolfellows, & very happy." On the 20th of this month our two little girls Mabel & Ruth are to go to a day school. Their lessons have been sadly neglected lately but I have found it impossible to teach them much myself, having so many household duties & so much sewing, besides the outdoor claims wh there are always are in a large family. Mabel has got on very well with Miss Herbert, but Ruth is a good deal behind hand. What they both need particularly, having good enough abilities, is regular discipline. I have a constant struggle with their untidy habits, wh at home it is difficult, as I am a good deal out, myself, steadily to counteract. After our return home, Mabel & Ruth went back to school, & they are now getting on very nicely there. They enjoy their lessons, & the walk seems to suit them well. They are very good, happy children, & a never ending delight -, all of them. 1874-01-02 "Our darling children are very well & very happy—sorrow as yet passes very lightly o'er their young spirits. May & Ruth have made good progress at school, & much enjoy their life there -"
1874-07 "In July during our children's holidays we spent a very happy fortnight at Grasmere with my sisters Carrie & Nellie." 1876-09 "In September the High School, wh had with much difficulty & after many delays, been organized, was opened, & our three eldest girls all began to attend it."
. . . in the spring of this year our dear Mabel took riding lessons with Mr. Forbes in the Riding School here, & soon became a very good rider. She had had some practice before on a little pony we had, wh. Ruth also rode, & rode well, until she turned nervous & refused to ride any more. 1877-08 . . . "Mabel had the rare treat of riding all the way to Grasmere on horseback with her dear papa, & a glorious ride they had." 1878-03 . . . "our dear Mabel has passed her jnr Cambridge Examination—with wh both she & we are well pleased." We had our darling Mabel home from York—& rejoiced in her sweet presence. She is one emphatically who makes "sunshine in a shady place." She is now a great girl of 15—quite as tall as her mother, & strong & full of activity. The next morning the 10th I took my precious Mabel to Cambridge to instal her into her room at Newnham in the North Hall under Miss Gladstone. The first night she slept with me at Mrs Holmden's the next day we spent in putting her room right, & arranging her things & the day after I left the darling child . . . . I forgot to say, in describing our arrangements, that our meals were brought to us, & deposited on the stairs where I went to fetch them in—Of course tea, I made for ourselves, & we were kept supplied with a little store of bread, butter & milk. After much anxious thought, we had decided that Mabel should go to Whitley, to lodgings for a week before coming home—we had taken Mrs Elder's nice lodging, where we were before, Mattie had been down & seen that everything was ready for us. Robert & my sister Carrie met us at Newcastle & were a few short minutes with us before we went on to Whitley & our rooms a joyful meeting indeed it was. Our rooms at Whitley were most comfortable—I settled dear Mabel in, & the next day changed places with Evie, who again changed with Ruth, & at the end of the week we were all—with thankful hearts, together at home again. 1886-03-06 "Mabel is studying hard—hoping to pass the Mathematical Tripos Examn shortly after Easter."
. . . Mabel passed her Examination in the Mathematical Tripos, & received warmest congratulations on all sides. After studying Chemistry in the Long Vacation at Cambridge (whence she joined us at Basle) she is now, to our great delight at home with us, & teaches Mathematics & Chemistry &c at the High School. 1889-07-28 "Mabel & Mary have spent six pleasant months in Dresden—& met many kind friends—& made good progress in German & music & singing." 1890-06 "Mabel has been teaching again in the High School -"
One little incident might have been serious, when Mabel glissaded over a snowfield, & shot over some rocks at the bottom. Happily she escaped with a few bad bruises, but it makes me shudder even now to think how differently it might have ended. While we were absent Mabel worked too hard—then came Christmas time with its many engagements, & Mabel quite broke down. Her poor circulation affected her hands so much that they became too painful & sore to use, & Dr Wilson said it was absolutely necessary that she should go South to a warmer climate. So, in much anxiety, we prepared to go immediately—my sister Carrie very kindly offered to go with us & we decided to take Bertha too. 1896-09-08 of Havera Bank, Sedbergh; stayed at Bensham Grove; "a most delightful visit—the first together"
Very anxious, for we hear that Mabel has a touch of pneumonia. Mother staying with the B’s, but may only see her few minutes each day. 2 nurses. Darling Mabel. It is hard on her, and just when, at last, warmer weather has come. Very bad news of Mabel. She is very weak, temperature still up and hardly seems to miss the children, though asks for them occasionally. Telephoned to York. Mabel just the same. Dr. gives little hope. It is terrible. Went along to St. Mary’s soon after breakfast and found that Mabel is much worse. Ruth sent for and Evie telegraphed for Ernest who came to stay with us. A dreadful day. Frank went with us to see Father and Mother, but had a slight temperature and could not go out after dinner. In the morning he and I went up to see Mabel. She was unconscious and looked terribly ill, breathing hard and her eyes nearly shut, but rolling about. I was along at no. 12 about 8.30 pm. She was then much worse. Hugh had not undressed for 3 nights, but had been persuaded to tonight, but he was up almost at once, and Dr Auden was sent for. He said the end was approaching. Hugh and Mother were with Mabel at the end. Laurie had come over. Bertha and I went to tell Father to come, and then Laurie came here with me to tell Ernest and Evie and Frank. As we went, he said ‘Mary, it’s all over’. It was terrible. Ernest and Evie and I returned, but Frank couldn’t come. Hugh asked me where he was. We sat, all of us, in the drawing room, weeping, and then Hugh put his arm round me, and took me to see Mabel. Evie and Ernest followed. Up to the last Hugh had hoped, but as we went upstairs he said ‘It is hearty congratulations for her, for I know best what she has had to endure’. I could hardly bear it and felt afraid of screaming, but I kissed Mabel—our beloved, precious, unselfish, brave, oldest sister—who has been like a Mother to me—and then came down and returned to Frank and baby. Oh, it is hard, hard and one’s heart aches for poor Hugh, and the children, whom Mabel loved so, and who were so devoted to her. 1907-09-16 of 12 St Mary's, York; d. there. Defective circulation induced scleroderma, for which cause and cure then unknown. So unable to rally from pneumonia. Her mother had been with her in York for the last two weeks of her life. A glorious very hot day. It seemed almost a mockery to put Mabel to rest on one of the days she had so longed for this summer, but which never came. Still we were thankful for it. In the morning I went to No. 12 and Molly looked after baby most of the morning. I took her up with him to see the coffin covered with wreaths. She cried quietly and I let her hold baby. It is terrible to see the empty bed. Lots of people arrived at different times—Aunt Hope, Norbert, Joe, Aunt Emmie and Uncle Harry, Fosters, Claphams etc. Aunt Car and Aunt Nelly K. (There was a Masters’ Meeting in the morning—Hugh went for a few minutes.) (The school re-opens today and some of the boys and masters were at the funeral). After dinner, Evie, Ernest, Frank and I walked to No.12, and at 2.15 there were gathered into the drawing room all of our family, and of course Molly, Colin and Esther dressed in white with grey coats and holding lovely flowers made up by Ruth I believe. Cousin K and Cousin David—Aunt Emmie, Uncle H, Laurie, Aunt Car (who drove with poor Ruth—poor because she has no husband to help her) Mr Ede and I believe one or two others. Hugh read us Mabel’s beautiful letter written to Sallie Pattinson 3 or 4 years ago (and nearly broke down) and then Cousin Kate with great difficulty told us that on the 16th the motto in her book had been ‘the master is come and calleth for thee’, and I think the next day ‘and she arose quickly and came unto Him’, and Cousin David prayed. Then we went out to the cabs. Hugh and children first, then Father, Mother, Aunt Car and Ruth, then the E’s and Frank and me, and then the B’s and Aunt E. and Uncle H. We walked the horses through Bootham (where the principal shops had their blinds down) and then went quickly to the Friends pretty green burial ground near the Retreat. Funeral at 3.0. Fielden Thorp, Cousin Thos P and Mr Ede spoke and prayed, and Father said a few words beautifully, ending with ‘The Lord gave, the Lord hath taken away, Blessed be the name of the Lord.’ It was pathetic to see Hugh talking to the children. I don’t think they understood and Esther wanted to wait and see the earth thrown in—there was no further service, but tea at No. 12, and after coming back here to feed baby, Frank and I went along, and baby was brought too for a short time. Everyone very kind, but I don’t realize it a bit yet. 1868-01-21 . . . "Ruth has just begun to walk quite alone, & is very proud of her performances. She is a child of a remarkably sweet happy disposition, & is the delight of all the household" . . . .
1868-12-25 "On Christmas day our dear little Ruth took the scarlet fever" . . .
c. 1869-04 "She is getting to talk now very nicely—she can say almost anything we tell her, & is at a very bewitching age." As for Ruthie, she is the pet of all the household, for a child with more winning ways there could not be. She has better features than May, & if she lives, I cannot but think she will have a really fine face. She is a very sensitive child, the tears ever ready to start to her blue eyes. If I reprove her at all, the struggle is often hard to restrain the tears, & the innocent subterfuge both amusing & touching. To day while May was busy with her lessons, Ruth wanted the box of bricks brought upstairs to play with. I said "Not now darling, but afterwards you shall have them in the nursery, & build a famous tower." Ruthie pleaded for them now, & still I refused,—then the poor little lips began to pout & the eyes to brim over with tears, & the little head was pressed to my breast, & between her sobs came a plaintive "Doot's eyen so watery," or as she calls it "fo vautery". Sometimes again she says, when struggling not to give way "Ma, Doot only tired" One day she said to me quite spontaneously, Ma doen Ma think God ever thinks about Dootie?" Her affection for us is unbounded, & she has sweet caressing ways of stroking our cheeks, & saying "fo foft" (so soft.) Many a time does she leave her play to come & kiss my hands, or to give me a good hug, interrupting me at my work as little as possible. 1872-05-14 "Dear little Ruthie is at Grasmere & we miss her much, but are glad to think of her as very happy with her Aunts, & with little Maurice, making that brightness in a house wh children only can." May & Ruth are making good progress at their school, which they continue to like very much. They are able now both to amuse themselves with reading (wh. Mabel has done for a long time) but and to take a great interest in many of the things that are going on, & to enjoy having books read & explained to them wh. perhaps they could scarcely understand entirely by themselves. Mabel has several times taken a part in our Shakespeare Readings wh we instituted last winter at our house. We choose a play, & invite some of our friends, assigning different parts to each to read & our own dear May generally takes on or two of the subordinate characters, & she really reads well, & with considerable appreciation. We have now in this way gone through "As you like it", "Merchant of Venice," "Macbeth", "Julius Caesar", "King Lear", & "Richard II" with great interest & profit. 1877 spring . . . "Ruth also rode, & rode well, until she turned nervous & refused to ride any more." 1879-02-27 . . . "Ruth much stronger, & getting on well at the High School" . . .
1881 Christmas "Ruth had drilled some of the little ones in representing "Mary Mary Quite Contrary"—Little Bo-Peep & other nursery rhymes" . . .
1884-03-27 "Ruth has left school, & is now going on with drawing, botany & music at home, or at the School of Art." In January our dear Ruth went to Bedford College in London, Mabel taking her. (I had been up from Cambridge in the Autumn & arranged for this) She found the routine work & regular hours & the rather strict regulations, a little trying at first, but she writes very happily, & we are convinced it is the right place for her. 1885-04-01 "Ruth looks very well—as if her London life thoroughly suited her—& she is so bonny." 1886-03-06 "Ruth is much happier now at Bedford College—& has many kind friends." Operation successful, but Ruth very weak. Fistulas operated on. At 5.50 Mother, Father Ruth and the nurse arrived en route for Newcastle. [ . . . ] They were in an invalid carriage. Poor Ruth was feeling the journey very much, having come off a water bed; she has been 5 weeks in bed. It was very pathetic to see her; she looked thin and worn and sobbed so. [ . . . ] Poor Ruth. She had 3 fissures removed, piles and something stretched—an hour under chloroform. We had about ¼ hr with them. The nurse seems very nice and kind. It was sad to let them go. We heard later that [ . . . ] Ruth had a fair night. Heard the thrilling news of Ruth's engagement to Edmund Gower. He has waited 14 years for her but it is terrible to think of his going to Tasmania, especially after she has been so ill nearly all this year. They are staying at Randapike and write happily. But now I must tell about my Ruth. My early journals say "a child with more winning ways there could not be." Even then her little subterfuges to hide pain were like the courage of her later years. I tell how when she was disappointed about some toys she only pressed her head against me & said "Doot's eyes so watery".—She was a lovely child with her golden hair & blue eyes—& a prettier pair than Mabel & Ruth would be hard to find. They were devoted to each other—I can never forget the meeting at Cullercoats after a long separation when Ruth had had scarlet fever—the exquisite delight of being together again. They went to their first school together, in Bewick Rd (Miss Every's) & afterwards to the High School. Later Ruth went to Bedford College, where she made many friends—chief among them Lily Weiss. This friendship may be said to be the first step in knowing the Weiss family, & to my dear Evelyn's marriage with Ernest Weiss—& later to Lily Weiss' marriage with Charles Spence. Ruth shewed great aptitude for drawing at Bedford College, & for Literature—She exceedingly enjoyed Prof. Hall's literary lessons, and we all know her love of music; she had an exquisite voice & a very good ear—& her singing has given delight to friends far & near. She had—I am speaking of a later time—a very large répertoire of songs—German & English & Scotch & Irish—Her enunciation was perfect—so clear one could hear every word & she sang with exquisite expression. Into the Irish songs she threw all the fervour of pathos for the sorrows of Ireland—her rendering of "The Arbretus Tree", & "Patrick Sarsfield" can never be forgotten—"Oh why Patrick Sarsfield, o why did you go?" Some of Christina Rossetti's too were most beautiful—"Stay June Stay" & "Who has seen the wind"? Songs for the children delighted them—"Little brown brother" "Molly with her broken toy" & "When a pig wears a wig." But indeed it is impossible to do more than touch on the charm & delight of her sweet singing—which was appreciated not only by those ignorant of musical lore, but by those of real musical gifts who often admired her singing more than that of professional & well known singers. Ruth was the beloved companion in many a journey—her eye for beauty in its many forms made her an enthusiastic & delightful one—only want of strength often sadly marred her pleasure. I was busy ironing in the morning, when Bertha came & showed me the terrible telegram (R. had stood operation well), that Ruth has malignant growth on the liver, hopeless & may linger a few months. We both sat & sobbed & sent a telegram of sympathy to Edmund from us all at York. It was a terrible day. Had to go out; when I got back at ¼ to 1.0 found telegram that “Ruth is sinking fast, unconscious, Mother not going.” I was miserable, & determined to go to Bensham by the 2.5. When F. came in before 1.30, he insisted on my having some dinner & then Brian Sparkes turned up, but we left him & had a cab & found Bowes going by the same train. Got home about 4.0 & found darling Mother & Ber sitting in garden. Mother very brave, but dreadfully troubled, not being able to go, but just waiting in suspense. Evie & children came in later. E’s telegram to me was not quite right. It really was that Ruth was sinking slowly, comatose, might linger 10 days”, so of course, Mother decided not to go. When we got back there was this telegram, “Ruth slightly better. Sleeping mostly. Little pain, takes liquid nourishment well. Sends love.” I felt this greatly encouraging for it shows she is conscious again. Telegrams cost 3/- a word & it is so hard not to be able to hear more. 1914-08-03 "In evening a better account of Ruth, thro’ Charles Merz’s office." Decided to stay in garden with children in case a wire shd come. Mother & all of us were picking sweet peas to send to workhouse quite happily baby helping too, & at about 10.15 I came in to get a pair of scissors. As I went round to front door, I met Percy in black, looking very sad, coming in at the gate, & I knew what had happened, & went to bring the precious Mother in. The cablegram was: “Dear Ruth passed away peacefully and painlessly this evening. Edmund Gower” 6.50 p.m. 20th. Aug. So she had really died last Thursday, & we had only just heard. It did seem cruel. 1871-03-13 "Evelyn is now nearly three months old, & is a fine healthy little thing, very observant & active—indeed I am inclined to think, the sweetest little baby there ever was." 1871-12-07 "Evelyn is now a fat little body, able to sit by herself & amuse herself, & as good & happy a bairn as could anywhere be found—every body's pet & delight." 1872-05-14 "Evelyn can walk now a few steps quite alone—she is a year & 3 weeks old—She is the merriest, bonniest bairn, with such fine dark eyes—It is quite time to have her photo'd -"
The children were all the time very well, & enjoyed to the full the delightful pleasures of that charming place. One memorable day we went up Ben Lomond—children & servants & all. We had a pony for dear wee Evie whom May held on her knee in going up, & I in going down. But alas the mists descended & the floods came, & we saw nothing from the top, & reached Rowardennan cold & drenched. But little Evie's behaviour deserves to be recorded—she sat on my knee all the way down, & wet & cold though she was, she never complained, but prattled away in her own sweet winning way, & when we, at last, got down the mountain, she said "Evie would ike to go up Ben Ormond adain". 1873-09 "As for little Evie, she is my sweet & precious little companion when her sisters are at school—how sweet & how precious words would fail me to tell." As for Evie I think a sweeter little thing never existed. She talks both very clearly & very intelligently for her age, & is a most companionable child. Many are the conversations we have together, & sore the questions that puzzle her little mind. We have an old dog buried in the garden, & she likes to go & see "Winnie's" grave. "Where is Winnie Mamma?" "Winnie is in the cold ground darling." "Where Grandmama is, Mama?" "Yes darling, only Grandmama is in Heaven, her spirit is in Heaven." "Then is Winnie in Heaven too Mamma?" When I told her one day the rain came from the clouds in the sky she said "The sky where Uncle Herbie is mama? Does Uncle Herbie feel the rain"? And when the rain & cold cutting wind were blowing in her face, she looked up to me with her happy smile "It's only a shower Ma." This evening after she was in bed, & I had said to her the invariably asked for "Noble Ark", she said her little Prayer. When she had finished, she said to me, "Ma say God make Evie a good little girl". I said these words, & the dear child seemed quite happy, & gave me the sweetest of kisses as I bade her farewell. But it were vain to try to tell her sweet little sayings, or to describe the charm of her winning ways. The first week in September we had a very pleasant visit from Miss Gibson, a sister of Mr. Gibson who often comes out to see us on Sundays, & who is always one of our Shakespeare readers—Miss Gibson is very artistic, & a very clever, but at the same time simple & pleasant girl. She pleased us much by taking a portrait of our bonnie Evie (on an old cigar box lid.) It is slightly painted in oils, & makes a very pretty little picture, though not a flattering one of our sweet child. The colour is certainly very good, & the likeness very fair, considering the difficulties under which it was taken. Our little Evie is a fascinating little thing—I could tell many stories of her winning ways, but will only put down one or two instances—Once at Grasmere, when Carrie had not been very well, Evie woke up in the night, & all she said was "How is dear Aunt Car?" & then, when satisfied, quietly went to sleep again. One night when I went to see her in her little crib & told her as usual the story of the Noble Ark, she asked me the curious question "Mama was God wet?" I said "No darling, God was up in the sky, in Heaven". She answered quickly "But the rain comes from the sky"—which made me laugh so, that I escaped the difficulty of a reply. She has quickly learned her letters, & now every morning is eager to say her little words, & to put together one-syllabled words out of her letter box. So I took dear little Evie with me, & we set off—spending a night in London on the way. We spent a fortnight very pleasantly at Bournemouth—at my sister's. 1879-02-27 . . . "dear little Evie thoroughly enjoying school" . . .
1882-12 "Evie would certainly have had one [a school prize] too had she not been moved into a higher Class, among much older girls." And now Christmas has come & gone—we had over 70 on Christmas Day—old & young, & a very merry happy part, "Cinderella", got up by Ruth, was charmingly acted by some of the younger ones—Mary being a sweet little Cinderella, Charles the Prince, (acted with great dignity) Ernestine the godmother, Evie & Dora the two unkind sisters, & George the Herald. "Evie was a charming little companion—never tiring, & never troubled with unnecessary fears, but full of interest & as merry as a bird, flitting hither & thither to get us raspberries or blackberries or picking up curious stones or wonderful fungi." 1884-02 At the prize-giving after the High School concert "Our little Evie took two, one for term work & one for Examn work" . . .
Evie has been most kindly allowed by Miss Cooper to work her Examn papers at her house (& Mary too). This was a very kind concession, & took away the regret of missing some school days. Dear Evie has come out 2nd in her form. We have not yet heard the results of the others. Evie is in the "Cambridge form". 1887-12-09 . . . "Evelyn has won the Company's Scholarship, tenable for two years" . . . So lest I forget this I must record our dear Evelyn's leaving the High School. Thirteen years has she been there, & it was a hard wrench to leave—but the memory she leaves behind her is indeed a blessed thing. I copy here what is written by Miss Wheeler & Miss Cooper—in her last report. "A pupil whom it has always been a pleasure to teach" ADW. "Evie's forgetfulness of self & large minded devotion to the general good have made her a power in the school where her work has been an ever increasing source of pleasure." J.C.C. When I called on Miss Cooper to bid her good bye—she spoke to me of Evie in words that were almost too touching—her voice was broken with emotion & her eyes filled with tears as she told me of Evie's goodness & unselfishness—"I never had such a head girl as Evie, the whole school will miss her, teachers & scholars alike, for she has made herself such a power in the school—& all in such a way that she has never let the thought or fact of her being the head girl obtrude itself." Words to this effect & more I cannot quite remember the exact phrases—& more—made my mother's heart rejoice with thankful joy—May God bless the future of this beloved child! I know how much she owes to Miss Cooper, Miss Wheeler, & some of the other teachers—& how happy these school years have been—The future must bring more care, more anxiety & responsibility with it, but she has a brave heart—She goes on the 25th of September to Mrs Bergman Østerberg's Gymnastic College at Hampstead—May her influence there be of good, as it has been in the High School—A new epoch begins in the dear child's life—a time always of sadness even if mingled with hope & joy. Evelyn is making good progress, & one of the interesting things she does is to teach swimming at Whitechapel—with the other resident students to some of the poor children of that neighbourhood. She also teaches gymnastic exercises at [Reremonde ?] to children who come in from the elementary schools—& she finds her physiological studies very interesting. THE Copartnership carried on by the Subscribers in the Albany Hall, Otago Street, Glasgow, under the Firm of SPENCE WATSON & WILSON, Teachers of the Swedish System of Drill and Gymnastics, of which the Subscribers were the sole Partners, was DISSOLVED, by mutual consent, on the 25th day of December 1897. Later, when we were living in Disley and Elsa and Erica, my two sisters, were both more or less grown up, Mother converted some of our old loft buildings which had come with the house (a stable and loose box and lofts, which we used to play in) for new uses (we were sorry to lose those places to play in), but she turned the inner loft into a little weekend place which she let to people for 1 shilling a night (the loo, incidentally, was in the back yard of the house and quite a long way off!). I think it went mostly to deserving people who couldn't afford much. The outer part she turned into a library for the village. She begged and borrowed and perhaps stole books right, left and centre and got people interested to help cover the books and catalogue them.
. . . "Mother was hopeless at languages." Lovely visit from Evie. A relief to see her so much better. To see Evie again in hospital. I am so sorry for her. She has been there several weeks and it is so dull as she can’t read. Lovely visit from Evie. She is much better at last, but can only see with one eye. I met Mabel in London and she took me to see my darling sister Evie. We spent about 3 hours with her—gave her her tea and supper. She has to be fed and is nearly quite blind, but I think she realized who I was, and listened to me, but a lot of her talking I could not understand. Evelyn (Spence Watson) Weiss was born in Gateshead in 1871. She was educated at the girls High School & spent 13 years there becoming Head of the School of about 300 pupils. When she left the Head Mistress wrote "I never had such a head girl as Evie; the whole school will miss her, teachers & scholars alike, for she has made herself such a poer in the school, & all in such a way that she has never let the thought or fact of her being the head girl obtrude itself". She left in 1889 & went to train in Swedish gymnastics at Madame Österberg's in Hampstead. Here among other things she taught swimming to the girls in Whitechapel. After completing her training she went to teach at the Mount School, York in the new gymnasium largely equipped by her directions. She also taught Sloyd, a form of Swedish wood carving. Her discipline was strict, but she was very popular & quickly made friends in the school & in York. When vaulting over the wooden horse one day to demonstrate how it should be done, a girl was overheard saying "Isn't she a picture?" & she did look lovely with her golden reddish hair. After several years at the Mount she taught for a short time in Cambridge to study anatomy & physiology & then & a friend started a centre in Glasgow for remedial exercises. 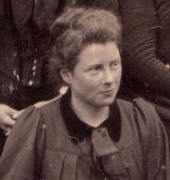 In 1898 she married F. Ernest Weiss, a professor of botany at M/C. University & for over 50 years they lived an ideally happy life together. There her 3 daughters were born. She was an excellent hostess, & full of vitality, giving of her best to many good causes. In the village of Disley near M/C. where she lived she started a lending library which became a very great boon to the district & meant a great deal of unselfish work on her part. She also equipped an out-house as a small week-end cottage where friends who needed a rest could come & enjoy the lovely garden. 1879-02-27 . . . "darling wee Bertha, the pet of all." . . .
1879-10-17 . . . "Dear little Bertha is quite a picture—so bonny & well, & so good tempered—soon the dear wee pet will have to "try the stirk stall" . . .
1880-05-04 "Bertha is now quite grown out of the baby—a tall strong girl, rather passionate at times, but very good & sweet for the most part." 1881-11 "Dear little Mary & Bertha are sweet little Kindergarten pupils, & are learning to sing so nicely—among other things." 1884-03-27 "None has improved more than our winsome little Bertha, who is wilful enough at times, but very good generally & so bonny & sweet." John Bowes went to call on her, in her lodgings at Acomb, to ask if she would help as a canvasser. The twenty-one-year old Bertha agreed willingly, and although the Liberal candidate was defeated the election was to have important consequences for two of his young supporters. Then, a few weeks before, she wrote & said we couldn't have it then, someone else wanted it. Mother was furious, & wrote such a strong letter that we got it all right, and Aunt B was so kind, providing an enormous box of groceries to greet us, and free riding. 1939 health giving rise to some anxiety. Bertha had always been an energetic woman. She had loved long walks on the moors, riding, swimming, and gardening. The beauty which had been hers in youth lasted, like the brilliant gold of her hair, well into middle age. Her children, when when grown up, found her a good companion. She had surprised her family, in her fifty-fifth year, by moving for the second time into the Mansion House. The Lord Mayor, Alderman Wragg, was a widower, and he asked Bertha to act as Lady Mayoress. When when was about sixty, however, she began to go lame in one leg. It was the first onset of arthritis, and in spite of all possible treatment the disease advanced. The only thing that spoilt the day was hearing that dear Bertha is suffering great pain with her hip, but she wrote me a lovely letter. A day or two later she was taken to hospital and X-rayed, and had a splint put on which allayed some pain. She is so good and plucky. Bertha has been very ill and in hospital, but is back at B.C. so on 10th Sat. I went to York to see her. She was much better, but still in her bedroom, and it was lovely to see her.
. . . had been an invalid for some time, but to the very end her courage did not desert her. When she was in pain she would try to straighten herself against the piano in the drawing-room or the sideboard in the dining-room. She was never heard to complain. Our little Arnold was born on the 6th of December, in the depth of a bitter winter, but he is was a strong healthy baby, & never seemed to suffer from the cold. He is now 4 months old, & the delight of us all—such a good tempered bonny little thing. Baby grew apace—he is now a bonny boy of 4 months old, bright & intelligent, & full of life—with full dark eyes, & growing I hope & trust, every day more & more like his dear Father. He is a great pet with all his sisters—little Mary especially delighting to nurse him & proving a capital hand. c. 1880-07 spent a fortnight at Whitley with Mary & Bertha, joined for the second week by Ruth & Evie; had been "looking very pale & pulled down"; after his return, "Arnold still pale, but much better than he had been, & so good & sweet." Our dear little Arnold had such a bad cough, after Dr Wilson left, that we became quite anxious about him, & even doubted whether we cld continue our journey. However we consulted Dr Stabel, the highest authority in Bergen & a very delightful gentleman, & he completely reassured us. He made a most careful examination of the child, & then told us his lungs were perfectly sound, but that his throat was slightly affected. He gave us some medicine wh had wonderful effect, for the dear little laddie seemed to lose his cough at once, & although we had been told particularly to avoid the damp for him, & we he was constantly exposed to damp, owing to the weather over wh we had no control, he gained strength rapidly, & never ailed anything more. 1881 Christmas "Our bonnie winsome Arnold went "round & round the Mulberry Bush" with the rest, & very lovely he looked in his Christmas frock worked by kind Mrs Dendy's skilful hands." Our precious children are all well, except that little Arnold has a cough, & is rather troubled with swollen glands (from his teeth, the Dr says) What a darling little fellow he is—to see his delight in pictures is quite a delight. I have not put down many things wh some day when I can find leisure I want to record—To night I am too tired, but I must tell two stories of our sweet little Arnold, who really is the sweetest & most precious little boy it is possible to imagine. He has a will of his own, & can be very naughty, but this rarely happens, & many a struggle the dear child has to conquer his self will. On Sunday among various other guests (Archdeacon Watkins among the number) Henry Tennant was here. He called little Arnold to speak to him, & after shaking hands with him said, "Well Arnold have you nothing to say to me?" when the gentle little voice naïvely replied "I am very well, thank you." Yesterday I told Arnold to shut the door—he objected & said Bertha must go & help him. This I would not allow—then he wanted Mary—but I forbad this also. Then I said "Won't Arnold try to be good—won't he try to be Mother's good little boy? Look at Mother & tell her." The sweet trusting eyes were raised to mine, & the sweet little arms flung round my neck with a kiss, & away the darling ran to shut the door. All his pretty prattle it would be impossible to describe—his recollections of Norway, of the steamer, of the bathing—his intelligent questioning—when I or his father have a headache his "I will kiss ou & make ou better"—his love for us all—his devotion to Mattie—he is so sweet that we dread setting our hearts too much on that precious little life. The dear father has not been at all well the last few days—it has been beautiful to see the little son so tenderly nursing him—sitting on his bed, & stroking him & telling him stories, & saying all manner of pretty things to him. But indeed no words could say how sweet & dear this little son of ours is—very shy with strangers, he pours forth his affection on us, & his loving ways & his pretty prattle are almost too sweet. When Dr Wilson & R. were talking one day of what profession some boy should be, R. said to Arnold, "& what will you be Arnold?" "I'll be a Liberal" was the instant reply of the dear little laddie, wh made us all laugh. Arnold, the sweet little laddie has had his first week of school. He declared he would not go—"I will follow you Papa wherever you go, but I won't go to school." However when the time came, he went without a murmur, & he has been so happy—& so good, Miss Sewell says.
. . . the sweet little Kindergarten children—our wee Arnold looking so bonny among them . . .
. . . our little Arnold has taken the measles, & we have had to send the other children off without him. He is going on well, & we must be thankful if he recovers nicely with no evil effects—but it is a bitter disappointment not to take the precious little laddie. The others their cousin Lucy with them, & Margaret & Charlotte (the two servants who are to do duty there) all went off this morning. Robert & I hope to follow tomorrow, if Arnold is still doing well—just over the Easter Monday holiday. The house seems strangely desolate—only the wee laddie upstairs in his nursery, tired & weak, the devoted Mattie who has worked splendidly though she is much disappointed not to go to Grasmere, & Mary the Cook . . .
"But I am not a gallant sailor Papa, for I was so sea sick." He would like to go to Norway in "chariots best." One day he was wishing for a writing wand—& said to his father—"I know what I'd wish for"—"What would you wish for Arnold"? And the sweet little voice whispered "That you needn't go to the office, papa." When he comes in to our bed in the mornings his little heart seems to overflow with love—He comes in between us & smothers us with kisses, & then begin songs & stories & endless prattle of the most bewitching kind, & Mattie's knock at the door comes far too soon. He is so like his dear father in face—may he only grow like him in mind . . . It was a pretty sight to see our little Arnold clad in his waterproofs, & carrying the fishing bag setting forth with his dear father, & many a weary tramp did he go without a murmur, many a wetting did he get without complaint—always wanting to carry & help in every way he could. A sweeter little companion there never was. Arnold would have made a capital football player: he used to play half back in front of me, and was getting to be a very useful man. What escapades he and Hugh Gibbins used to be up to! They climbed up a rainwater pipe outside, and forced an entrance into Gopsill Burtt’s room (the room above Arnold’s) when he thought he was secure behind his double doors. But they had some more serious fights to make than that, with one or two men that there were about then—I don’t mean physical fights—and they came out strong there too, I know. I remember well the great discussions we used to have in his room at times—he and Gibbins and Gill—and I was there sometimes—but was still something of the schoolmaster perhaps—too much so for quite an equal footing. I remember persuading him to read at one of the Socials—with great difficulty. Indeed I bought my copy of My Lady Nicotine for him to read a piece from: I think it was the chapter called ‘My Brother Henry’. And then too we had great difficulty in persuading him to begin to shave—when it really was getting very necessary. He must have had thy affection for long hair! This page was last revised on 2018-05-10.